Dial Press Trade Paperback, 9780385339308, 400pp. Matthew Acciaccatura of Teaneck, New Jersey, begins his freshman year at NYU in the fall of 1995 with one goal in mind: to become cool. A former high school outcast, used to lumbering the hallways alone in oversize turtlenecks, Matt seems an unlikely candidate for such a transformation. Yet by dint of effort he lands the coveted position of promoter at one of the hottest clubs in New York in the heyday of rave music and Ecstasy. However, as “Magic” Matt rises to fame, portents of tragedy begin to appear, literally in the margins of the story. Footnotes from one Dr. Hans Mannheim, an imprisoned German academic obsessed with Matt’s dangerous trajectory, suggest that Matt is not as in control of his destiny as he might appear…. 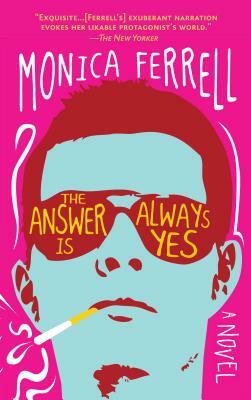 A gorgeously written archetypal tale of self-discovery (and self-deception) and a love letter to the enduring possibilities of New York City, The Answer Is Always Yes will keep readers guessing until its explosive climax. Monica Ferrell’s poems have appeared in the New York Review of Books, Paris Review, and other magazines, and her first collection, Beast for the Chase, was published in 2008. A former “Discovery”/The Nation winner and Wallace Stegner Fellow at Stanford University, she lives in Brooklyn. This is her first novel.